This time of year, we celebrate a number of holidays close together. It’s a good thing, because once the sun returns to Poland, people love to get outside, and I’m pretty sure the mental concentration of workers, students and pupils plummets. I know mine does! This year (2013), May 1, 2, 3 and 30 are all holidays. Since the 1st through 3rd are Wednesday through Friday, many people take off Monday and Tuesday as well, in essence getting a 9-day vacation. May 30, Corpus Christi, always falls on a Thursday, so most people take the Friday after off, as well. May 1 (May Day) has significant pagan origins. However, since 1889, it has served as the International Worker’s Day, commemorating the Haymarket Affair in Chicago, when police shot and killed 4 demonstrators. Of course, it has been closely associated with socialist, communist and anarchist groups, undoubtedly as a result of it’s origins. According to Wikipedia, over 80 countries celebrate May 1 as Labor Day, and in Poland it became a national holiday in 1950 – under communism. I find it interesting that after the fall of communism, May 1 was not abolished, in spite of its status as the premiere communist holiday. I would attribute this to two reasons: 1. No one wants to give up a holiday, whatever the reason it was established. 2. It was a labor union (Solidarity) that brought about the downfall of communism. It probably makes more sense to celebrate that victory of organized labor than it does to commemorate the Chicago tragedy. May 2 is Flag Day in Poland, commemorated since 2004. It isn’t officially a day free from work, but nearly all schools, and many companies, make the day a holiday. It was instituted really just to have a holiday between May 1 and May 3, although it does commemorate a couple of significant events related to the Polish flag. May 2, 1945, Polish soldiers who entered Berlin planted a Polish flag on top of the Reichstag and the Victory Column, as a sign of defeating the Third Reich. Under communism, after the big communist May Day celebrations, Poles would take the flag down on May 2, in a symbolic protest against the fact that the Communist authorities abolished the May 3 holiday. May 3 is – in my opinion – the proudest holiday in the Polish calendar. It commemorates the establishment of the Polish Constitution in 1791. This constitution, second in the world, was a monument of democratic ideals. Considering the Polish context, surrounded by the Russian and Austrian empires, and the Prussian kingdom, the Polish constitution was far braver than either the American or French, written in the same period. In effect, the constitution was valid for only 14 months, before some of the nobles, along with the Prussians, betrayed the Poles, and the Russians conquered the Polish kingdom. Then, in 1795, Poland was divided among Russia, Prussia and Austria and ceased to exist for 120 years. The Polish constitution has some similarities with the French and American constitutions, but retained a monarchy, modeled after the English. It gave voting rights to most of the population, limited the king’s power, gave more structure to the legislative and judicial branches. It also removed voting rights from a number of nobles who had gained them by decree of the king. In addition, it guaranteed tolerance and freedom of all religions. Later, during the war against the Russians, Prussians and Austrians, the Polish leader – and American Revolutionary War hero – Tadeusz Kosciuszko, declared his own “Emancipation Proclamation” granting voting rights and land to peasants who fought against the occupying forces. The May 3 holiday was first instituted in 1791, banned in 1795 by the Russians, Prussians and Austrian, and reinstated in 1919, when Poland regained its sovereignty after World War I. It was again abolished by the Nazis in 1939, and spontaneously celebrated in 1945. The Soviet occupiers banned it again in 1951, and it was reestablished in 1990, after the fall of communism. It has served as a symbol of Polish unity, patriotism and democracy – hence its abolition by each successive occupier of Poland. Now, although there are patriotic events on all three days, for most people it means 3 days to spend with family, outside, picnicking, enjoying the spring sun. Unfortunately, this year, someone forgot to tell the sun to cooperate!! Part 3 of reflections from a class on “Missional Leadership,” taught by Dr. Reggie McNeal at Columbia International University. In part one, I shared Dr. McNeal’s description of the “missional” church, and some thoughts in relating that to our Polish context. In parts 2 and 3, I am sharing a series of paradigm shifts that are necessary in order for us to think and behave missionally, with comments from our context. From institutional manager to movement leader. Dr. McNeal did include a caveat that “institutional management” is still required in many cases – the deacons from Acts 6 are one example. But he suggested that even the most bureaucratic of leaders can move in the “apostolic” direction. In class, he described an apostolic – or movement – leader as one that: has a genuine vision; is Kingdom-centric (not church-centric); is entrepreneurial – a risk-taker; is genuinely spiritual; is a developer – releasing people; is a team player. I think that this type of leader is an extension of the previous shift – from program driven to people development. When we stop focusing on programs, and begin focusing on people development, the institutional manager – or program manager – becomes less important than the person who can develop and release people. Simply by changing our focus, most of us can move in the direction of being a movement leader. Of course, out of the thousands of people who followed Jesus, and later became the church, only a handful were considered apostles, and only a handful were true movement leaders – but that’s ok. Today as well – I may do my best to foster a movement in Poland, but it will probably be someone else who becomes the catalyst. In the end, though, it’s the movement that counts – not my ministry, or the church or denomination I serve. Hence the kingdom-centric focus as opposed to a church-centric focus. There are a handful of Polish leaders who nearly fit this description. They have a real vision, are entrepreneurial, and are genuinely spiritual. Denominationalism is still a big problem, and the kingdom-centric focus is not yet a reality. Many Polish evangelical leaders frequently struggle with developing and releasing leaders and with being a team player – as opposed to being a lone ranger. But I believe there are more such apostolic leaders today, especially younger leaders, than there were a generation or two ago. The description that we have above gives us a better picture of what areas still need development among leaders. Of all the shifts Dr. McNeal mentioned, this one may be the most difficult to implement in Poland, at least among evangelical churches. Roman Catholic apostolic leaders – and there are a few – will have a much easier time implementing such a shift. The reason for this difficulty is based in the historic idea that “To be Polish is to be Catholic.” When converts leave the Roman Catholic Church to become Evangelical, their ties with family and friends are significantly weakened. Frequently, evangelical converts feel less “Polish”, and, as a result of being ostracized, even feel betrayed by their nation. Evangelicals have a hard time being “community-centric,” and frequently prefer to hunker down in their church bunker. Of course, one response to this difficulty is to encourage believers to remain in their Roman Catholic network. But many growing Christians have a difficult time remaining in a church that they see as having betrayed a sacred trust of teaching truth. So they leave, feeling betrayed by the Church, and then betrayed by their loved ones who don’t understand their decision. The growth of postmodernism and pluralism is opening an opportunity to see this tension change, however. Traditionally Catholic Poles are becoming more accepting of differences, and all believers need to take their focus away from church brand and onto a community that desperately needs assistance and a Christ who can rescue it. Part 2 of reflections from a class on “Missional Leadership,” taught by Dr. Reggie McNeal at Columbia International University. In part one, I shared Dr. McNeal’s description of the “missional” church, and some thoughts in relating that to our Polish context. The people of God need to refocus their hearts and resources on the world. We have focused mostly on ourselves, but we need to remind ourselves just how much God loves the world. It really isn’t enough to pay lip service to this, but we must also demonstrate this shift through our use of resources, and through the behaviors we reward. One very practical idea that Dr. McNeal mentioned was to get involved in a nearby public school. There we can see and begin to meet nearly all of the needs around us. Polish evangelical churches are usually strongly evangelistic. Their methods are frequently outdated, but the desire is strong to win their country for Christ. And with 0.15% evangelicals, there’s a lot of people to win! Most evangelical leaders are much more focused on building their church than they are on building the Kingdom, but there is very little of the apathy that sometimes characterizes churches in North America. However, their small size and position as a cult makes it difficult for the churches, as organizations working independently of one another, to get involved in community services – whether schools, community centers, or compassion organizations. So, a better way may be to lessen the organizational involvement, and encourage individual believers, or small groups, to get involved as volunteers in community organizations. In the end, it isn’t about increasing the visibility of our church in the community – a common error that churches in both Poland and America make. What matters is blessing the community where we live. I’m convinced that doing that actually does increase our positive reputation, but when we make blessing the goal, rather than popularity, we contribute more to advancing God’s Kingdom, rather than our own. Unfortunately, most Polish churches have understood a successful church to be one with multiple programs. In fact, Polish evangelical leaders have usually used American megachurches as models for ministry, resulting in a large degree of frustration when the Polish spiritual reality does not bring the same results they read and hear about in America. There definitely are different areas to address in people development in Poland than there are in America, but I have to think that a focus on growing people and not programs will probably be much less frustrating and more rewarding in the Polish church. Granted, mentoring and discipling can also be frustrating at times – but the Polish church sometimes has such wildly unrealistic expectations toward programs that a people focus might actually turn out to be a huge relief! In addition, programs are resource hogs – and the Polish evangelical church is pretty poor, both in money and number of personnel. Of course, as Dr. McNeal also mentioned, a focus on people development does not mean an elimination of all programs – rather it means a restructuring of priorities. If we can recapture the people focus, we can be more intentional about letting people try and fail – in order to learn and grow – even as they lead or participate in a “program.” The “success” of the program becomes subordinated to the “process” or growth of both the volunteers and the recipients. As a small personal aside – I get very frustrated by teachers from the West who come and tell the Polish church how it should be done. Their ideas are sometimes so wildly inappropriate in the Polish context that it’s as if a bunch of Martians came to tell us how to plant crops. And yes – I’m an American, attempting to influence my Polish brothers and sisters. And I’ve probably made just as stupid statements over the years as some of these big church teachers make here. God forgive me and us. However, 14 years of toiling alongside my brothers and sisters here, of wrestling with similar cultural issues and slow growth has helped me understand this context better, and helped them consider me one of them. We won’t change Poland by implementing an American church growth program. We might change Poland by focusing on people instead of programs, though. Again, much of what Dr. McNeal said in class can be found in his book Missional Renaissance. In “Missional Leadership,” Dr. Reggie McNeal challenged us to rethink both church and mission, but especially then to involve ourselves in the adventure that such a rethinking could initiate. He helped us define “missional church”, shared with us several shifts that identify a missional focus, and helped us think through some leadership challenges for bringing missional change. However, the concept that will probably have the most ongoing impact for all us is the idea of changing the scorecard, of counting and rewarding those activities that matter most. Much of what he said in class can be found in his book Missional Renaissance, which I reviewed here. I’ll include some of my highlights from the course, especially focusing on the missional church, and a brief response. I’d like to especially focus on the potential impact or difficulty I see in applying these highlights in our Polish context. “Missional church is a redundant term” (RM). The church (the people of God) are sent. They are on a mission – always have been. Among Jesus’ last words in the Gospel of John, we read, “Peace be with you. As the Father has sent me, even so I am sending you.” A number of times in the New Testament, we see Jesus sending His disciples (Mt. 10:5,16; Jn. 17:18; Acts 9:17; 22:21; 26:17; Rom. 10:15). When we partner with God, as the people of God, we join with what God is doing in the hearts and lives of people – in and out of the church community, but more frequently outside of it. God is not confined to a shrine, and works of ministry should take place on the street, where people live and hurt and love and die. Partnering with God in His redemptive mission in the world means finding people who are also involved in His mission, and blessing them. It also means functioning as God does and blessing those who are not blessed and have no hope for blessing. In Poland, there is significant potential for building on the idea of the people of God. There is a growing willingness to put denominationalism aside in the family of God. However, the chasm between Roman Catholic and everyone else remains wide and deep in any way that involves Church hierarchy. There are still frequent spats between evangelical churches over prospective or wandering members. If anything, though, this may force all of us into looking past church structure to truly be the people of God. The Polish word for blessing can have a double entendre meaning of “pregnant,” so the term may or may not work (a pregnant group, of course, also implies multiplication – a very good thing). Of course, simply beginning or naming groups “blessing groups,” is not sufficient. We need to learn how to bless others, and even more important, how we can contextualize blessing others in Polish culture and engage our Polish brothers and sisters in blessing their communities. The Holy Bible : English standard version. 2001 (Jn 20:21). Wheaton: Standard Bible Society. After 14 years (and counting) of living and working in Poland, I have absorbed far more of Polish culture and attitudes than I usually realize. One characteristic of Poles is that they frequently struggle to celebrate success. It hasn’t been considered good form to praise others, lest they get a big head. Poles laugh at their own parenting proverbs like “don’t praise a child, or you’ll spoil him.” As a nation, they are realizing that praise can be a positive motivator, although there is still significant resistance to the idea. And as a nation, they are becoming a model in Europe for economic growth and other changes in a very difficult time – although many Poles would not admit to this (see above). So, when I think about and want to celebrate WorldVenture’s 25 years in Poland, this goes through my head: “I need to be careful in case a) someone thinks I am being proud, and b) someone thinks I am comparing our organization to others to make us look good.” Of course, if I didn’t think WorldVenture and our team in Poland was the best choice for us – I wouldn’t be here. I am proud of our organization and our team. However, as I shared in the last post – there are several other amazing groups serving in Poland. I know many of those servants are just as proud of their “tribe” as I am of mine. Am I comparing? Well, maybe sometimes. We all have that strong temptation in ministry, and it becomes one of our besetting sins. Depending on our personality, we either compare and end up feeling bad about ourselves, or compare to feel better about ourselves (pride). For instance, my personality usually goes in the second direction – my wife’s, in the first. I don’t think the end result actually has anything to do with the real facts, but everything to do with our personality and temperament. So just by saying “we’ve been here 25 years” I can do a “one-up-man” on my friends from other organizations. (Also worded as “nah-nah-na-nah-nah”) Yes, sometimes even veteran missionaries act like junior-highers! Seriously, though, although I love the history our organization has here in Poland, I’m thrilled any time I run into someone new who is serving here. As I said in the last post – there aren’t very many of us here. Way too few to spend much time comparing. And way too much to do to not bless one another and work together as much as possible. 2. Having the humility to not push an American agenda, but to discover and assist in a Polish agenda. 3. Having the endurance to stay the long haul. Some of our people are among the longest serving North American missionaries in Poland. 4. Having the flexibility to develop a multi-cultural team. Long before this was a popular topic in our mission, we had a team that was made up of people from 5 countries on 3 continents. For years, at least a quarter of our team has been Polish. 5. Having the grace to forgive and build camaraderie. Our team truly has a family atmosphere. “We all owe an incredible debt of gratitude to Campus Crusade.” My colleague, Dennis, was reflecting on the first years of WorldVenture in Poland. And he’s right. Although WorldVenture is one of of the oldest North American missions in Poland – I think we were second – Campus Crusade arrived ten years before we did. And Crusade personnel helped our first people get apartments, language teachers, visas, connections with church leaders, and on and on. Every mission organization in Poland owes Crusade a debt of gratitude, because most of us have continued to help one another, in a kind of “Pay It Forward” ethos. Poland has one of the lowest percentages of evangelicals in the whole world – at 0.15%. It’s number of missionaries per capita is among the lowest in the world, as well. Wladyslaw Dwulat, president of the Evangelical Alliance of Poland, estimates the total number of missionaries at 120, out of a total population in Poland of 38.5 million. The number of missionaries is down, from a high of 180 in the early 2000’s. Perhaps these low numbers have helped all of us be more cooperative and less competitive. In any case, our team in Poland has also experienced the rich blessing of being able to partner closely with several other organizations: TEAM, SEND International, Fellowship of Evangelical Baptists International, and Josiah Venture. In each case we have seconded or received seconded people into our team. In addition to Campus Crusade, we have been able to work closely with Greater Europe Mission, Christian Missionary Alliance, International Mission Board, Pioneers, Reach Global, European Christian Mission, International Messengers and probably several others that I never knew about. Of course, probably even more important than our cooperation with other North American missions has been our opportunity to work closely with Polish evangelical organizations. We have primarily been connected with the Polish Baptist Union, reflecting our heritage as a historically Baptist mission organization. In addition, we have worked with the Church of Evangelical Christians, the Church of Free Christians, independent fellowships, and the Evangelical Alliance itself. Our first personnel modeled a pattern of ministry that subordinated their/our agendas to the agendas of our Polish partners. Based on their model, our team worked to continue that ethos. Thankfully, we have an international structure that allows us to set strategy at the field level, and enables us to be supportive of national workers’ agendas, as opposed to finding nationals to support our agendas. “I thank my God upon every remembrance of you” (KJV). As we reflect on 25 years of our organization in Poland, we continually come across memories of people from other organizations and churches who have been vital in our ministry. Thank you, God for our brothers and sisters. Hopefully, just as so many others have been helpful for us, we have been faithful in serving others. This year our organization celebrates 25 years of residential ministry in Poland. Although we had teachers with Biblical Education by Extension traveling from Vienna to Poland during the early 1980s, the first two families to move to Poland arrived in 1988. In the next few posts, I want to reflect on our presence here. First, I want to post a letter to WorldVenture people from Wojciech Szczerba, the president of the Evangelical Theological Semininary of Wroclaw (EWST, in Polish). His letter brought tears to my eyes. Of course, much of what he says does not exclusively apply to WorldVenture, but to all of us who have left family and friends to move to a different country and culture in order to faithfully incarnate the love and grace of God. First of all I would like to send you warm greetings from Evangelical School of Theology. It seems amazing that World Venture celebrates this year its 25th year of operation in Poland. It’s been crucial years in the history of our country: the end of Communism and its 45 years rule over Polish nation, the beginning of our free country with Solidarity movement, the pontificate of John Paul II, the entrance of Poland into European Union structures and the European Soccer Championship last year. Amazing piece of history, tremendous changes over the last 25 years. I am sure many of you remember how it was in Poland at the end of 80’s. The poverty of the nation, grey streets in our cities, empty shelves in our stores, coupons to buy basic goods, long lines to get anything, corruption, black market and the overwhelming weariness of Polish people with the impossible situation. What made you come then to our country, destroyed, poor and wounded? How did God touch your hearts and call you here? How did you find your place here, with such a predominant role of the Catholic Church, seemingly the only opposition to the oppression of the Communists and the core of Polish soul? I would love to hear your stories. I would love to take a look at my country through the mirror of your experience. I would love to kneel with you and pray. I remember the beginning of Biblical Theological Seminary in Wroclaw as the student of this school in the first group of students. I remember the challenges, problems and difficulties, but also great teaching, wonderful books, ministry opportunities, thousands of people over the world praying for our school and many coming to serve our country. I was so impressed to see people leaving their countries and homes to come to us and humbly serve us. It was a very important testimony of faith for me, a young believer then, and – I am sure – for many other people in Poland. World Venture, Conservative Baptist at that time, was among the groups, which impressed me the most. Time has passed by very quickly, many things have changed here and our country looks different than 25 years ago, new generations have emerged with different attitudes toward reality, different values and worldviews. We are experiencing nowadays the first waves of secularism, a phenomenon unthinkable even a few years ago. We are a different country now in comparison to the end of 80’s. Still, World Venture is here and faithfully serves our God and nation. You are in various churches including Evangelical communities, traditional Protestant churches and the Catholic Church. You serve in many Christian organizations, schools like Evangelical School of Theology and social institutions. I am still impressed, chapeau bas. And I thank God for your good hearts, for your willingness to serve and for your obedience to the Almighty. You give a wonderful example to many people in Poland, you faithfully preach and live the Word of God. I truly regret that I cannot be present at the Celebration of World Venture. However, even though I am not physically present, I am with you spiritually. With other friends from Evangelical School of Theology we pray for you and thank God for you. You are in our hearts and our prayers. Our doors are always open to you. This ethnographic survey has deepened my understanding of my adopted homeland. Although Catholicism is the dominant religion, it was very interesting to see the animistic influences, and the prevalence of postmodernism. I also want to continue to ask all of my Polish friends some of the questions from the survey. One of the benefits to conducting a conversation in this manner was the way that the conversation could naturally turn to spiritual topics. Two ladies told me after our conversation that they felt like they had just been to confession. One couple that I interviewed has been our acquaintances for 11 years – and this was the first time we talked about spiritual issues. I’m looking forward to seeing what else we discover, and how we can use that to serve better in Poland. I’m including the questions that I used – maybe someone else will be interested. The English questions are from the Human Relations Area Files at Yale University. The Polish questions combine a few of the English questions, and my friend Radek helped me by correcting my Polish. The questions are designed to not point people toward certain answers, so for instance Christian terminology is avoided. A couple of the questions in Polish required me to explain a little what I meant. They are correctly translated, but I think the topic was a little too foreign. Who do you tend to listen to, and why? Are some people thought of as more important than others, and why? What do you believe about death? What do you think happens to a person when they die? Where do people go in Poland to find spiritual power? How do you define spiritual success? What kind of spirits are there? Do ancestors affect your life now? How does a person gain spiritual power? What role does luck play in everyday life? Do you have any practices that relate to controlling luck or fate? Do you have any special or sacred objects? Are there places where spiritual power is evident or available? Have you ever gone to a sacred place for blessing? What was that like? How do you feel when you come into a holy place? Are there certain things or places that you avoid? How do you discern the will of God? Are there spiritual specialists that you or people in Poland consult? Describe these and the functions they fulfill. What important religious organizations exist in Poland? Do they have much authority? Describe the leaders of these organizations? How do they relate to other people? How much trust do you place in science? What questions can science not answer? Which has greatest priority in your thinking, people or production? Do you consider that rules apply equally to all persons or do some people have special privileges? Is time more important in your day to day life or do you feel comfortable enjoying events and not paying attention to time? How do you determine whether something is right or wrong? How do you determine whether something is true or not? What factors are important in proving something? Do you believe certain things in spite of what you think may be true? Do you cling to certain beliefs in spite of evidence to the contrary? Kto jest dla Ciebie autorytetem, i dlaczego? Co się stanie z człowiekiem po śmierci? Skąd ludzie najczęściej czerpią duchową siłę? Jak byś zdefiniował duchowy sukces? Czy wierzysz w duchy? Jeśli tak, jakie duchy istnieją? Czy uważasz, że twoi zmarli przodkowie mają wpływ na twoje życie? Jaką rolę, według Ciebie, odgrywa fart lub pech w codziennym życiu? Czy masz jakieś sposoby na kontrolowanie swojego losu? Czy posiadasz jakieś przedmioty, które mają dla ciebie duchową wartość? Czy uważasz, że są miejsca, gdzie duchowa moc jest obecna lub dostępna? Czy byłeś kiedykolwiek w takim miejscu? Jak się czułeś? Czy są miejsca, które uważasz, że maja negatywny wpływ na Twoje życie? Spróbuj opisać swoimi słowami swoje wyobrażenie Boga lub istoty wyższej. W jaki sposób możesz odkryć wolę Boga? Czy są duchowi eksperci w Polsce, z którymi ludzie się skonsultują? Jakie funkcje oni spełniają? Jakie ważne organizacje zajmującym się rozwojem wewnętrznym człowieka istnieją w Polsce? Czy mają jakiś autorytet dla Ciebie? Proszę opisać przywódców tych organizacji. Jak oni traktują innych ludzi? Na ile ufasz nauce? Na ile nauka kształtuje twój światopogląd? Czy są pytania, na które nauka nie potrafi odpowiedzieć? Czy uważasz, że zasady dotyczą wszystkich jednakowo? W jaki sposób rozsądzasz czy coś jest prawdą albo fałszem? Jakich kryteriów używasz? W jaki sposób rozsądzasz czy coś jest dobrem albo złem? Czy masz jakieś przekonanie, pomimo tego, że to może nie spełnić kryteriów prawdy? Animism covered with a 1000-year old veneer of Catholicism has also produced a strong legalism. On the one hand, this has probably been the most significant reason why divorce, homosexuality and abortion are still rare. The shame connected to all of the above practices keeps them in check. On the other hand, Poles don’t usually consider God or Church as contributing to their happiness. Manipulation and legalism remain prevalent in the evangelical church, as well. We who proclaim a Christ who died once and for all, who proclaim a salvation sola gratia still think we can work the system, and add our own rules to God’s unmerited favor. In addition, working the system is still praised by many evangelical leaders – even now that the political system is no longer blatantly anti-God. We wallow in a slough of legalism, but continue to use the only methods we know – working the system – to try to clamber out. And we can’t make it. Paul addresses our problem in Galatians 5, and points us toward freedom in Christ. Manipulative false teachers had preached the necessity of following the law, in addition to belief in the Christ. The practice of circumcision is used by Paul as an example, “but for a Gentile Christian to accept circumcision by choice, as a matter of religious duty, implied the acceptance of the whole way of life to which circumcision was the initiatory rite.” And Paul says that “for the Galatians to submit to circumcision as a legal obligation would be an acknowledgement that law-keeping (in this particular form) was necessary for the achievement of a righteous status in God’s sight. Such an acknowledgement would be to nullify the grace of God”. Instead of a voluntary return to the slavery of the law, Paul points us toward freedom in Christ. “For freedom Christ has set us free; stand firm therefore, and do not submit again to a yoke of slavery” “The juxtaposition of an indicative followed by an imperative is a common grammatical feature in Paul’s writings . . .The imperative, ‘Stand firm,’ not only does not contradict the indicative, ‘Christ has set us free,’ but in fact results from it. Because of who God is and what he has done for believers in Jesus Christ, Christians are commanded to ‘become what they are.’”. Our identity, according to Paul, is that of sinners set free. In verses 2-4 Paul describes the potential results when we voluntarily choose a different identity. We are in danger of “falling from grace” and being “severed from Christ.” Why? Because when we choose law and legalism, a manipulation of the system, we choose our own ability to keep the rules (or at least work the system) instead of a total reliance on the Christ who died for us. Christ is really of “no advantage to us,” because we don’t need Him! So, instead of a Christ-denying legalism, whether based on our evangelical rules or Catholic sacraments, we proclaim a freedom in Christ, based on His death and God’s grace. It’s not a cheap grace – it cost Him everything – nor is it an excuse for unholy living. Actually, it’s the foundation for love and good works. But, in proclaiming our true identity in Christ, we emasculate legalism and remove the need to manipulate God with our rituals, rules and relics. In the final post, I’ll give a short conclusion to the ethnographic report, and include the questions we used. Bruce, F. F. (1982). The Epistle to the Galatians : A commentary on the Greek text (229). Grand Rapids, Mich.: W.B. Eerdmans Pub. Co. The Holy Bible: English standard version. 2001 (Ga 5:1). Wheaton: Standard Bible Society. George, T. (2001). Vol. 30: Galatians (electronic ed.). Logos Library System; The New American Commentary (352–353). Nashville: Broadman & Holman Publishers. Schaff, P. (1997). The Nicene and Post-Nicene Fathers Vol. XIII (36). Oak Harbor: Logos Research Systems. Keller, Timothy. (2008) The Prodigal God (37-38). New York: Penguin Books Ltd.
 Duvall, J Scott. “Identity-Performance-Result” : Tracing Paul’s Argument In Galatians 5 And 6.” Southwestern Journal Of Theology 37.1 (1994): 32. ATLA Religion Database with ATLASerials. Web. 2 Nov. 2011. Ontology is the philosophical study of being – what exists, what does it mean to exist? Our study focused specifically on the existence of God, the spirit world, and life after death. We also asked some questions relating to the influence and authority of the church in the lives of Poles. In the paragraphs below, it would be helpful to remember that the total number of respondents was 11, although not everyone answered every question. In 2008, the Polish Center for Public Opinion Research conducted a poll that indicated that 94% of Poles believe in God. 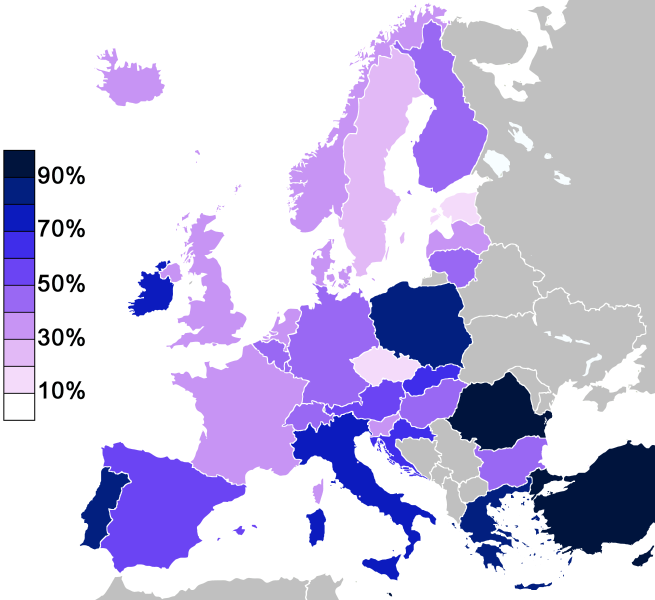 Earlier research done by the European Commission in 2005 showed 80% of Poles believe in God, with another 15% believing in some spirit or life force. Of the 10 people who responded to our question about God, one didn’t believe in God, and two weren’t sure if he existed. One of the seven who believed in God had nothing to say about his perception of God. However, seven people – including one of the ones who wasn’t sure he existed – had a description of God. Of those seven, three thought of him as a person (including one of our afore-mentioned agnostics). The other four thought of God as a force, or energy. The personal terms included “Almighty” “merciful”, and “forgiving”. One young man sheepishly referred to God as a “kind old grandpa.” The ones who specifically described God as a force said that He is a powerful, positive energy for good. These respondents indicated that God works in people’s lives, that He gave a feeling of security, that He was the quintessence of knowledge – but yet, they did not see Him as a person. As an aside, the fact that in English, in this section, I use a male, personal pronoun for God has no connection with how our respondents referred to God. In Polish, the word God is male and personal, but it’s a function of grammar that then requires the pronoun to also be male and personal, in the same way that in Polish “car” is male and requires a male pronoun, and “truck” is female and requires a female pronoun. Although it may be that the majority of Poles think of God as male – without it simply being a function of grammar – our respondents showed a surprisingly high incidence of thinking of God as non-personal. For many of our respondents, the issue of death seemed to be the one that most engaged an emotional response – and even influenced the rest of the conversation. One person – the atheist from above – said that death was purely biological, and the person ceased to exist. 10 of the respondents were not sure – calling death a big question mark – although they had a few ideas. Two young men said they tried to never think about death. One young man said the Moslem idea of death was better – going to heaven and having 40 virgins. Only one person stated what I would consider a Catholic view of death – that when we die, we go to purgatory, and then on to either heaven or hell. According to him, even an atheist would have a chance in purgatory. The most common idea was that after death, we live on, not as a soul, but as a force, or a ghost, in a different dimension. We remain able to see what happens here, and sometimes to influence it. Not a single respondent thought of life after death as a corporeal existence. The view of death is intertwined with the view of the spirit world. Three of the male respondents do not believe in ghosts, or in any kind of spirit. They also didn’t see their ancestors as having any influence over them, other than genetic, or perhaps as an example to follow. All of the female respondents, and two of the men, however, do believe in spirits. One person (our faithful Catholic from above) specifically mentioned the “Holy Spirit”, and several believed in good and evil spirits that can possess a person. I was surprised at the stories that the questions about spirits and our ancestors prompted, however. Several respondents began to share how their dead mother or father had talked to them, intervened in their life, or rescued them from danger. Even one lady who said she didn’t believe in ghosts went on to share two stories of how her mother, after death, had rescued her. Three people used the idea of “guardian angel” and “dead parent” interchangeably. The question of death, spirits, and ancestors is one that should be explored much further. With the importance of All Saint’s Day in the Polish calendar, and the important Catholic practices of prayers and masses for the dead, it is easy to see how significant this issue is for Poles – and we evangelicals focus our attention on attacking Catholic practice, rather than attempting to understand the functional worldview of those around us, and proclaiming the real hope of eternal life in a New Heaven and New Earth. The Church was reviled, criticized and kicked to the curb by most respondents. And I emphasize – all of the respondents would consider themselves Catholic. It was not mentioned as a place of spiritual growth, nor were its leaders considered to be authorities – with the glaring exception of John Paul II, who made nearly everyone’s list of authority figures. As an observer, I would say that Poland is in a time of upheaval concerning the influence of the Roman Catholic Church in society. There is a media and popular backlash right now against church personalities and positions. This probably partially explains some of our respondents’ negativity. However, some of the issues are deep-seated and enduring. It is likely that the Church’s position will continue to weaken. Special Eurobarometer Special Eurobarometer Wave 63.1 225 (June 2005) 11.